Contact the Administration department for all issues related to the purchasing of merchandise, accounts payable, and general information. Contact the Captains for all information related to the Sloop’s functioning, as well as for information on being employed as a crewmember. Contact the Development department for all information regarding supporting Clearwater’s mission through sponsorships, planned giving, memberships, and corporate partnerships. Contact our Environmental Action department for all information regarding Clearwater’s environmental advocacy, the Hudson River Watershed Alliance and environmental issues affecting the Hudson River, Hudson Valley, and New York State. Greg spent his childhood sailing on the Hudson, swimming in the Croton River, and going to Clearwater Revival on Croton Point. After preparing for public service with a B.A. in Government from Dartmouth College, Greg spent three years helping whistleblowers and researching waste, fraud and abuse in federal spending. After returning to graduate school to study organizational behavior, Greg has spent twenty-five years helping organizations of all sizes build strong cultures, and overcome challenges. When not working, Greg may be on the water, in the kitchen, or reading a Government Accountability Office report. Erin joined Clearwater in March of 2014 and currently manages the day-to-day operations, human resources, administration, as well as public relations at the Beacon office. Originally from Queens, NY, Erin is a US Air Force veteran and served as a command post controller in Delaware, South Korea, Oman and England. 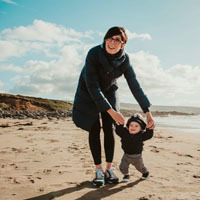 Erin holds a MA in Writing from the National University of Ireland, Galway, where she lived for the next 5 years working in rural Clare, writing, and hosting a radio show called Sunday Best. Erin also has a BA in Sociology with a minor in Painting from SUNY New Paltz. Erin is most passionate about music, writing and being outside! Erin lives in the City of Newburgh with her husband, Rob and their future Clearwater sailor, Dustin. Captain Nick Rogers returned to Clearwater as relief Captain in October of 2007 and full Captain in January of 2008. During his previous stints on Clearwater, he worked as 2nd Mate during the 2005 season, and as Engineer & Bosun before that. Nick received 2 degrees from the University of Rochester in physics and applied mathematics. 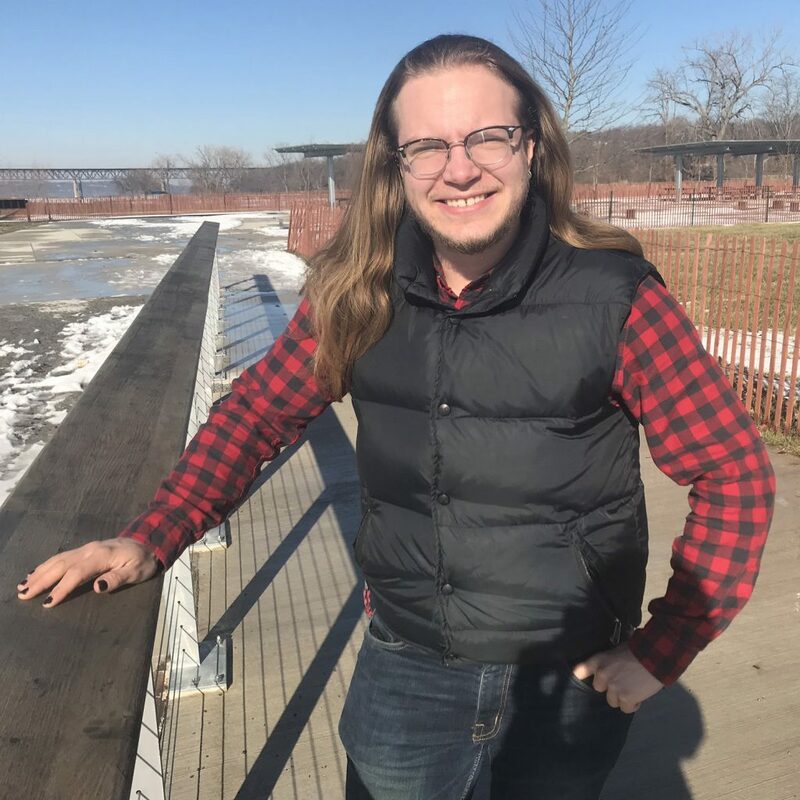 He has experience working with youth as an Environmental Educator and Trail Crew Leader with the Student Conservation Association and as an Educator with a YMCA camp in New England. If a home flag is to be flown for Aleythea, it is the flag of Cascadia. Having grown up on an island, being surrounded by water seems not only natural but unavoidable. Aleythea’s first sailing experience was on the schooner Ruben de Cloux at eight days old. Her toddler years were spent on the longboats Porpoise and Discovery’s Launch. The summer after middle school she began sailing on the schooner Adventuress, first as a participant, and eventually spending multiple seasons both sailing and in yard. 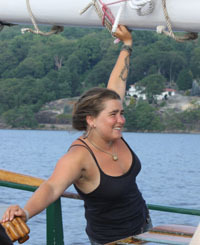 Having dedicated a majority of her time on the waters of the Salish Sea working with environmental education and environmental and social justice, coming to the fine and splendid sloop Clearwater just made sense. Aleythea is happy to be working in a place where the folk tradition of making voices heard, strong in the face of injustice, and sailing a tall ship successfully meld together. Enjoys climbing stuff, playing hot dice, a well done Hudson River gybe, cilantro, bonfires, making a cozy nest, and tea with milk and honey. Shipboard titles have included but are not limited to; volunteer, deckhand, educator, rigger, spare part, bosun, first mate, trouble, winter coordinator, watch officer, and captain. Ann Mellor started working at Clearwater as Development Assistant / Membership Associate in April 2009. Previously, Ann served as Membership Associate / Administrative Assistant at the Hastings Center in Garrison, NY for 7 years. She is married and lives in Beacon, NY with her husband Michael Mellor. They came to the Hudson Valley in 1984 from Rochester, NY. Ann and her husband raised their two wonderful daughters in Beacon; one daughter, Mary Joe, is married and serves in the U.S. Navy, and the other daughter, Christine, served in the Air Force and is now to be married and living in Rochester NY. In her free time, Ann loves to cook, read, travel, listen to music and watch movies. Diane von Roesgen Oktay brings over 20 years of experience in fundraising and program delivery. She has written successful proposals for foundation, corporate and government grants ranging from $2,000 to $1.3 million. Her experience includes work with non-profits in the field of education, environment, out-of-school programs and museums. 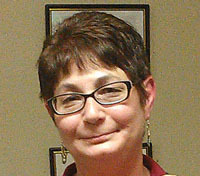 Diane started her career as a counselor and program manager. She holds a BA from Cornell University, and an MEd in counseling and an MBA in non-profit management, both from Boston University. Manna Jo Greene, Clearwater’s Environmental Action Director since 2000, was formerly the Recycling Coordinator/Educator for the Ulster County Resource Recovery Agency for more than 10 years and a registered Critical Care Nurse for 22 years. She holds an AAS in Nursing, a BA in biology (pre-med) from SUNY/New Paltz, and completed course work toward a Masters in Environmental Sciences at Bard College. A lifelong environmental professional and community activist, Manna avidly supports collaborative land use planning and problem solving. Working to promote sustainable agriculture and green building and landscaping practices, she teaches communities how to integrate environmental preservation, economic prosperity (based on quality of life indicators), and social equity using effective communication. 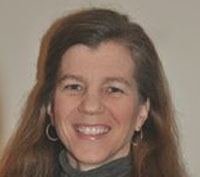 Manna also serves as Ulster County Legislator from District 19, Towns of Rosendale and Marbletown. 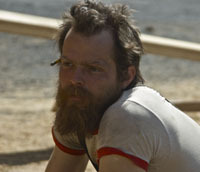 Erik Fyfe first sailed with Clearwater back in 2008. Originally hailing from the southeast, he immediately fell in love with the Hudson River and spent several seasons on the sloop as engineer, second mate, and winter crew. Ever since his time as a crew member, Erik has been engaging people of all ages to learn about and help protect rivers. 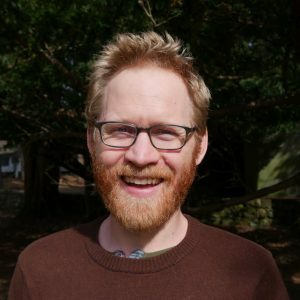 With a background that brings together environmental education and advocacy, his past work includes protecting the Chattahoochee River and its tributaries in Georgia. On the Hudson, Erik believes the best way to get to know the river is by pulling up the Sloop Clearwater’s sails with 40 fourth graders. He is proud to be part of the team helping make that happen every day. Eli grew up in Indianapolis, Indiana. He spent his childhood sailing small boats on the lakes and reservoirs there. 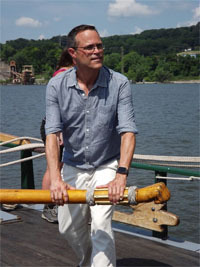 In 1994, after graduating from New York University with a BA in Art History, he began working in shipboard education. He crewed on Soundwaters, and HMS Bounty, was the first mate on the Lettie G. Howard, and spent time on various boats in Baltimore Harbor as part of Living Classrooms Foundation. With Living Classrooms, he ran the Customized Job Training department. He has worked at Clearwater since 2005. 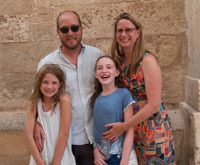 When not on the river, he enjoys cooking, soccer and hiking with his family and dogs. Keene is from the woods of northeast Connecticut’s Quiet Corner. Their exposure to boat life began at a young age since their parents frequently took them along to the Boathouse at Mystic Seaport to volunteer. 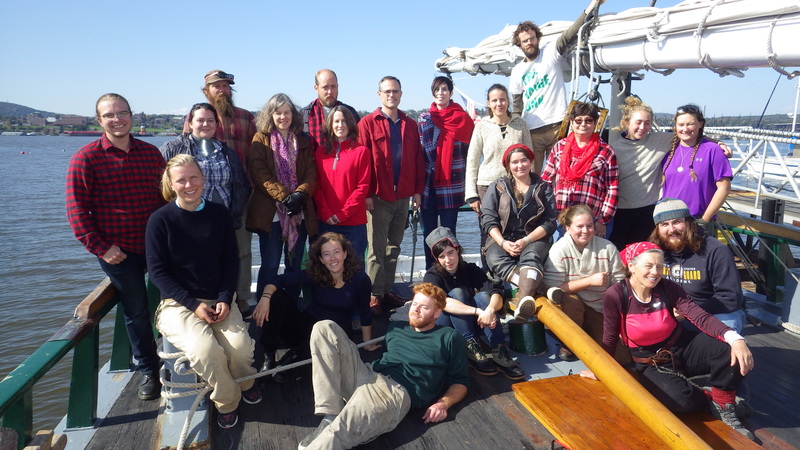 After completing degrees in environmental geoscience and geography, Keene took their first position on a tall ship: education intern on the Clearwater. 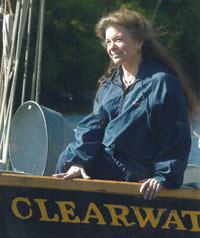 Since then, Keene has been a cook, educator, deckhand, volunteer, and education coordinator on a range of vessels, including Adventuress and Mystic Seaport’s schooner Brilliant. When not working on or for boats, Keene makes maps and leverages GIS for geospatial analysis, climbs rocks and hills and trees, doesn’t use their French minor for much of anything, drinks an awful lot of lapsang souchang, and recommends N.K. Jemisin’s The Fifth Season to anyone who will listen. Sam hails from Yorktown, New York, and holds a B.S. and M.S. in Earth and Atmospheric Sciences from Cornell University. 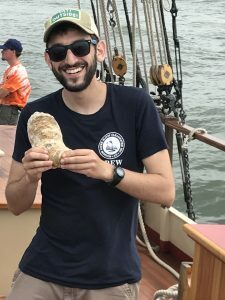 He returns to Clearwater after serving as Education Coordinator aboard the Mystic Whaler last year, and has also worked as the Program Coordinator and Winter Volunteer Coordinator aboard the Schooner Adventuress in the Puget Sound. Sam enjoys playing ukulele, bouldering, and juggling, and has driven across the country seven times in the past two years. Amali grew up in Baltimore, Maryland and quickly developed a strong love for the environment, especially on the water. 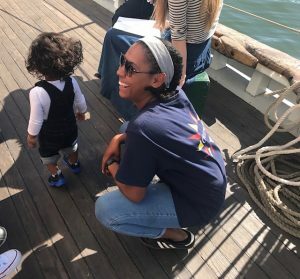 She discovered her love for boats early on through student investigations facilitated by the Living Classrooms Foundation in Baltimore. Amali’s father, who is an experienced and storied ship’s captain, ensured that her love for being on the water was solidified when he enrolled her in a three-week sailing program on the CMS Tole Mour during the summer of 2012. During college, Amali spent her summers interning at organizations throughout New York that developed her in the ecology and community of the Hudson River Valley. After college, looking to get back into work on the water, Amali took a position on the Clearwater as an Educator Deckhand in the fall of 2017. Amali has also been an outdoor educator at Hudson River Park in Manhattan and at the New York Botanical Gardens in the Bronx and is committed to engaging with young people from all walks of life. Amali loves soccer, cooking, reading and spending time with her three year old nephew.